The other day a random email popped into my inbox. Intrigued, I clicked, and saw the words: “Binaural Dinner Date”. “Across the table, within arms reach is another human being. Is this the one? How many questions need to be asked before you feel like you are getting to know each other? Binaural Dinner Date is an audio experience that looks at dating from the inside out. The word “Binaural” obviously intrigued me, given that Antenna are part of BINCI, a Europe-wide initiative to make binaural sound-creating tools more accessible, and given that we are currently working on immersive 3D-audio storytelling experiences ourselves for cultural institutions around the world. I decided to buy tickets. Pulling up to the Stratford Theatre, looking through the glass at a mostly empty restaurant with people standing around, and desparately driving in circles to find parking, my girlfriend and I almost turned around to go home. Boy, was I glad I didn’t. What then followed was an experience I’ll never forget. We were immersed in the sounds of a busy restaurant environment. Amidst this we could hear each others voices. And another voice – a narrator of some kind, giving us directions on what to say. I quickly realised my date was not being given the same instructions! This resulted in a highly amusing and gripping exchange which, amidst the 3D soundscape, felt somewhat like an out-of-body experience. First, a small diorama with minature figures and scenery was placed on our table. These were 3 couples on dates in various locations: a park, a museum and a restaurant. We were taken to all 3 in sequence: fully immersed in the imaginary locations with the binaural sound, listening to the trepidation and blunders of awkward first dates as if we were there. It was incredibly emotive. Second, our waiter, constantly moving around us setting tables and serving drinks, came and entertained us and the adjacent couple with unusual ‘games’ of varying format, asking questions, timing answers, getting us to move and say things depending on the format of the game. With the 3D sound, it was an almost ethereal experience, like being in a game show, or being shown a magic trick. 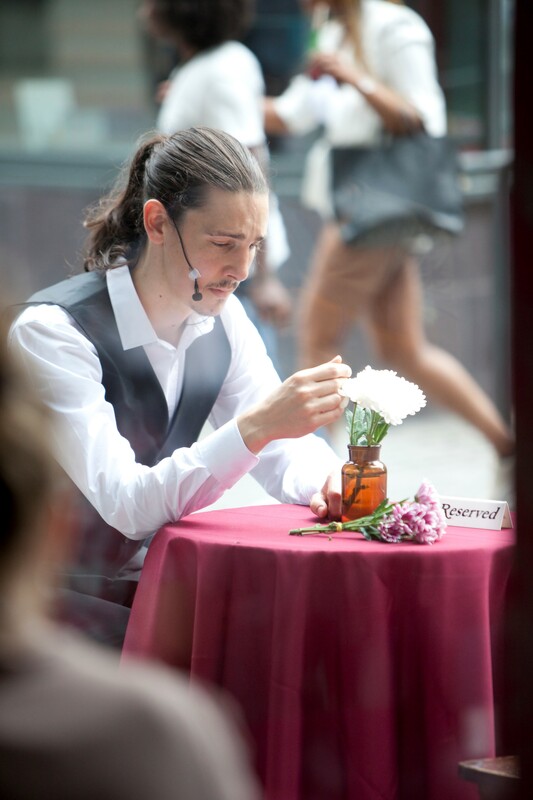 Thirdly (and the real highlight for me of the night’s experience), our attention was turned to the windows of the restaurant, as the narrator asked us to contemplate a pocket of East-London life through the glass in the square outside. I won’t go into the detail here, safe to say that as improvistion goes this was thrilling, moving, and utterly unique. “Binaural dinner date” is a truly interactive, organic performance which successfully uses a technology which is arguably in its infancy to create a complex, multi-layered storytelling experience that makes you feel viscerally alive, not through clever tricks, but through original ideas and great acting. Brave, daring, and humble. highly recommended. 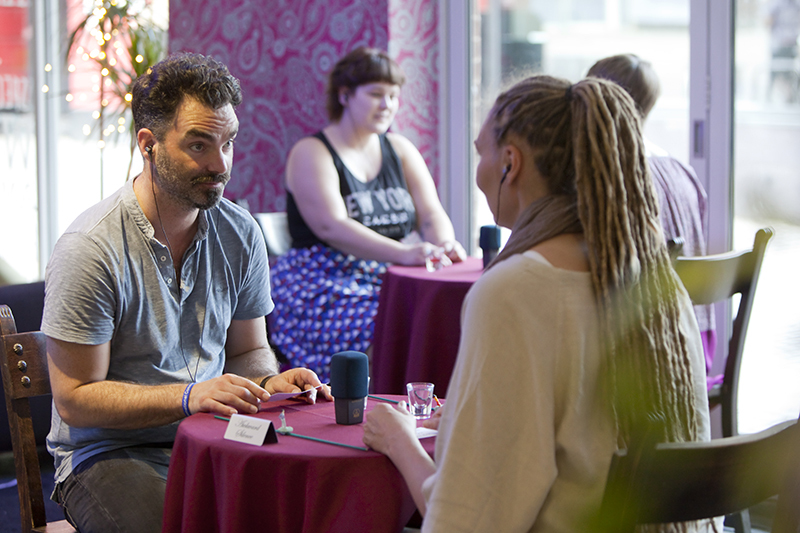 Binaural Dinner Date by ZU-UK is running from Thu 16th November – Sun 3rd December at the Stratford East, London. Book your tickets here.